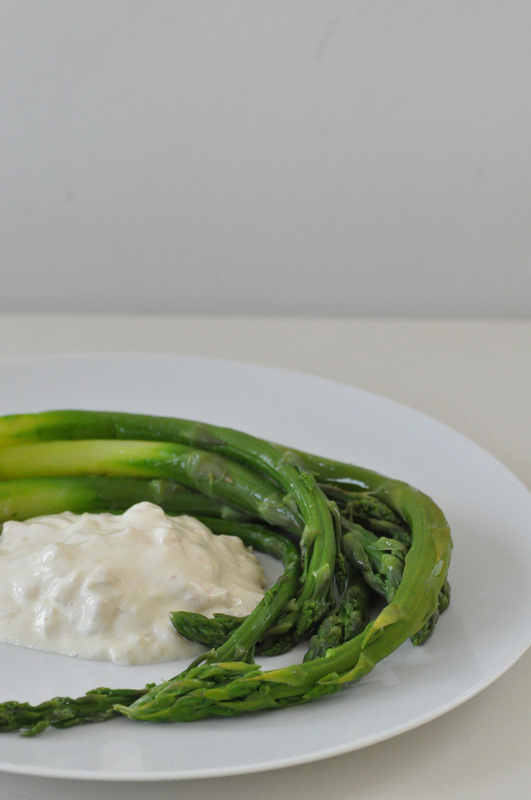 green asparagus and mayonnaise lovers … attention please! this dish is made for you! and by the way a perfect lunch or dinner for such early hot-summer-days as we have at the moment. it tastes perfectly when completely cold and requires almost no cooking. the origin of this recipe was a bit surprising to me, as i found it in a japanese cookbook and had no idea that japanese cooking includes mayonnaise. but it was a very good learning experience. thank you harumi kurihara for your japanese home cooking book. the ingredients list is as simple as the cooking. you need green asparagus, mayonnaise, shrimp and a bit of lemon juice or a splash of white wine. enjoy this dish and your asparagus season! cut off the asparagus’ lower ends and peel as much as necessary (it depends on your asparagus how much you need to cut off). cook the asparagus for a few minutes only with some salt and a pinch of sugar. i prefer if the asparagus keeps its bite. pour it in very cold water after cooking to stop the cooking process and to cool down the asparagus. in the meantime you can prepare the shrimp mayonnaise. i usually use pre-cooked shrimps, so I only have to mix them with the mayonnaise and a bit of lemon juice or a white wine (don’t take too much, as you don’t want your mayonnaise to liquify). if you use fresh shrimps you have to cook them in advance and let them cool down. i like to squeeze the shrimps (to drain any water) before adding the mayonnaise, but it is up to you. vom grünen spargel die unteren enden abschneiden und wenn nötig schälen (abhängig davon wie viel vom unteren ende weggeschnitten wurde). den spargel wenige minuten mit etwas salz und einer prise zucker kochen. ich mag ihn noch bissfest. nach dem kochen den spargel mit sehr kaltem wasser abschrecken, um den kochprozess zu stoppen und die bissfeste konsistenz zu bewahren. This entry was posted in recipes, spring and tagged asparagus by The Cook. Bookmark the permalink.